It's Pep Rally week and we are here today to share a sampling of the NEW Paper Smooches OCTOBER release with you! THREE new stamps and NINE new dies will be available to purchase on September 30th at 8:00pm pacific time. Once our release goes live, you will find our new products HERE. Deadline: You have until midnight PT on Sunday, September 27th to leave a comment. Please check the Paper Smooches blog on Monday, September 28th to see if you are one of the FOUR lucky winners. The Holly die and the Merry Christmas die are also from the new release. To make the sentiment a bit bolder, I layered two of the die cuts together. So much fun making holiday cards again! Thanks for hopping with the Paper Smooches gang today! The next stop on the hop is the lovely Kalyn Kepner! Have fun! Super cute card! I'm going to case this idea of turning the jar upside down! Love it! Oh my goodness... I absolutely love your shaker card!!! I would have never thought about putting the jar upside down. Fabulous idea and so cute too!!! So creative and cute. Love the idea of the snowman inside the mason jar. How clever!! Super cute idea!! Love it!! What an adorable snowman-in-a-jar shaker card!! Makes me smile, JJ. Oh so very cute- I'm gonna have to own this mason jar!! What a cute idea! I have thought about making mason jar snow globes with my students. I love this idea! That is the cutest idea ever to turn that jar upside down. Love it! What a precious idea to turn the jar upside down! And who can resist a shaker card? Love the mason jar shaker card; so cute. Ooooohhhhh this is adorable! !! I love shaker cards! Love the different snow globe! Very clever use of the mason jar. Card just looks so homemade and inviting. Just adorable.... love every perfect detail!! super cute! love your cute snowman jar! Love theta snowman jar. It reminds me of the snow globes we made as children in school. Love "swanky snowdudes" and the versatility of the faces. This is a must set for me. Thank you for the card and inspiration. Great idea, and a very cute card! I really like that MERRY CHRISTMAS die. Your shaker card is fab! I absolutely love your shaker card, that has got to be the cutest thing ever. What a creative idea to use the Mason jar die to make a snow globe. Awesome! Such a cute cqrd - perfect for adding to homemade snow jars! Such a smart lady! Genius. Absolutely love the snowman shaker! Cute idea with the jar. How innovative to transform your mason jar into a snowglobe! And the wee snowman, paired with the new products, is so adorable! You must have been wearing a smile all over your face when designing this card! Festive fabulous! I love the card, it is soooo cute and fun!!!! Oh.my.goodness. Adorable die and I LOVE how you used it! This is sooo awesome! Cute and clever! Thanks for sharing. this little snow globe Mason jar brings back childhood memories! I love that you used a jar for the snow globe - how adorable! I think this is so creative I'm going to borrow your idea! Thank you so much! That jar die is too clever! Great card! Oh how cute! Love how you turned the jar into a snow globe! Such a great idea to create a snowglobe with this mason jar, JJ! You are so clever...Love this card so much!!! How clever to turn this into a shaker / snowglobe! You're still surprising me JJ! This card is wonderful! Clever way to use the mason jar…I may have to steal this idea! Adorable! So many fun things you can do with this! That is adorable! I love the snowman in a jar. Very cute card! Love the mason jar die and the way you have turned it into a shaker element! LOVE your "mason jar" card, it is just so cute. Oh I love your little PS jar upside down!!! JJ this is so adorable. I love how you turned the jar upside-down! 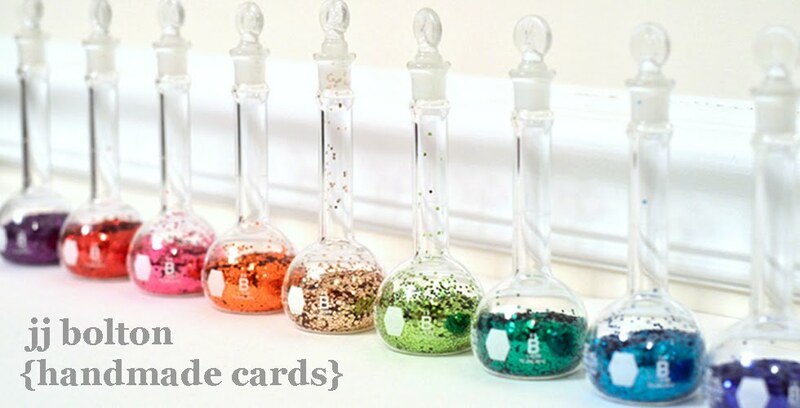 Cute idea for a shaker card! Oh my word!! This is adorable!!!! Love that holly die - and the Merry Christmas too! This is the cutest idea! I just LOVE the upside down jar shaker card! Adorable! This is a great design!! Love it!! Fabulous shaker card! Love the upside down jar for a snowglobe. Great idea! I love the snowman and the jar for a shaker. Love your cute shaker jar, such a fun design! Love this card. I love shaker cards. So cute! Shakers are the best!!! Great idea to use the jar as a shaker! What a wonderful card. Love it. Love the jar as a shaker card-thanks for the inspiration! Very nice shaker card !! Adorable, and how clever to upend the mason jar! That upside-down mason jar/snow globe shaker is just too cute. Thanks for the idea. Adorable shaker, and another cool die!! That's a super cute card using it as a snow globe! Adorable! Love the inlaid shaker technique! Love this technique and such a cute card! Too Cute, JJ!! I love your jar cards! This is so much fun with the snowman-snowglobe. Thanks, Paulette S.
Love the jar/snowglobe! So cute! 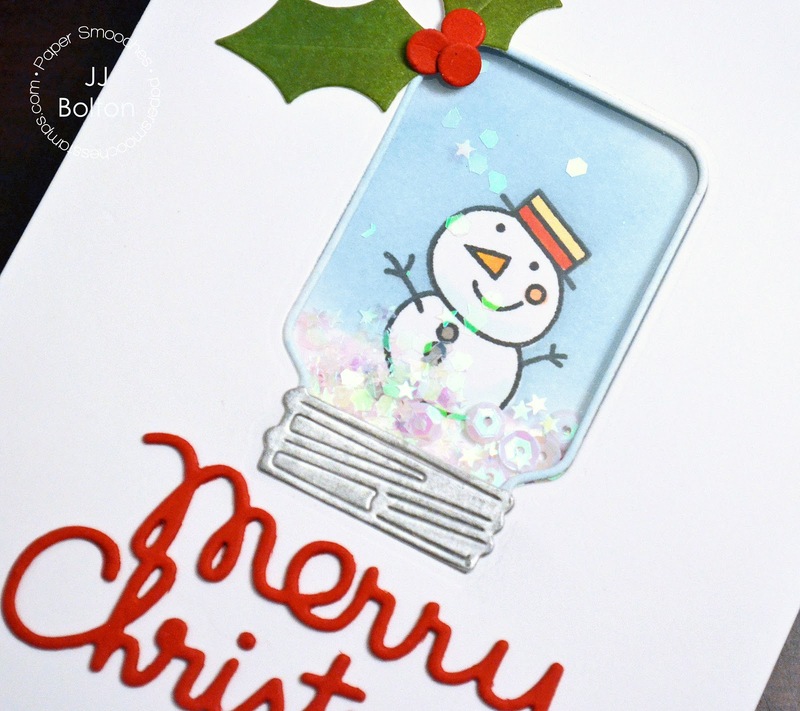 Love this snow filled fun jar with a beautiful die cut release, impressive designing, love it! Very cute stamp set. Adorable card! Your shaker card as well as the stamp and dies are adorable! Oh!! I love this card and the idea. I've made a bunch of mason snowglobes so I immediately knew where your inspiration came from. Swoon I LOVE this adorable shaker card!! Such a sweet snow globe shaker card with this adorable mason jar! Love!!!! Adorable! What a cute idea. Thanks for sharing. Great shaker. I would never think to turn the jar upside down. What a great idea to use the jar and make a shaker card, I love it. This is so cute. Reminds me of the ones my kids used to make with baby food jars. Ha I've seen these snowglobes in the craft world but didn't think of it on a card...so fun! so darling! love how you used the jar upside down to make a snow globe! OMG I adore this card! I ❤️ Snowmen AND snow globes and this card is just perfectly adorable! JJ, your work is absolutely beautiful! I saw you on the Paper Smooches and Avery Elle blogs. Your work sure grab one's attention. Maybe someday you'll do technique/How To videos. Adorable! Love how the snowman is in the jar! WOW - the mason jar is AWESOME, a MUST-HAVE, LOVE how you have used it to create the shaker, LOVE IT ALL!!! It was a pleasure to share about the new release and blog hop. I Love Your card. It is totally adorable! Seriously! Okay, permission requested to make this my 2015 Christmas card!!!!! Lovelovelove! Lovely--love the mason jar with snowman, so cool! JJ, your shaker card is so pretty and sparkly!!! What a cheerful little guy! LOVE the upside down jar! Such an adorable snowman shaker!! Love the shimmery sequin snowflakes!! Shared on FB about the release. Love how you made it a shaker card. Cutest card ever! 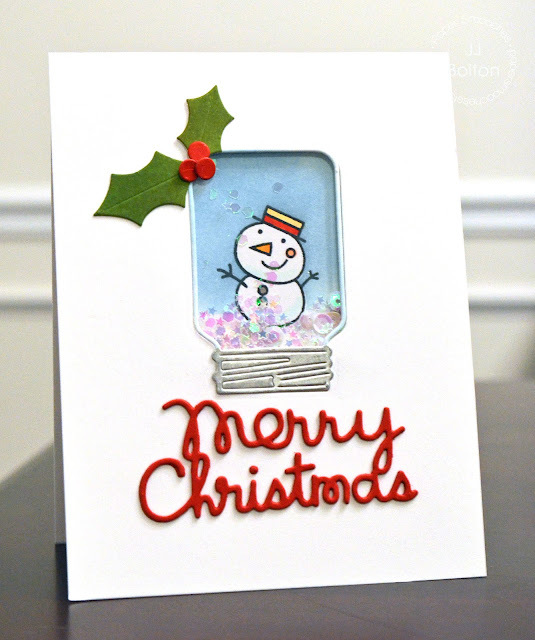 Love the use of the jar die with that adorable snowman inside! What a great card! I love, love, LOVE the Mason jar shaker, and the little snowman inside is to DIE for!!! The cute snowman is perfect for the snow globe shaker card. I like the Merry Christmas die too. I posted to my Facebook page about this fantastic blog hop! So cute! Love the mason jar shaker and I really love that new sentiment die too! The upside down mason jar!! So smart. Thanks for sharing your talent. EEEKKK! I can't wait for this mason jar! Your idea is fabulous! I think this is the best of all the mason jars I've seen! I love the lid on this mason jar. It is the best I've seen. So cute! Absolutely adorable, and my favorite shaker/Christmas card of the year!!! I love how you turned the Mason jar upside down...so clever! And, so sparkly, too!